If you decide to finish off the carpet to laminate transitions after the laminate is installed, I will describe the steps necessary to do this. This procedure is not normally recommended for the novice if your not too familiar when working with carpet, especially the carpet knife which can be very dangerous. Its often better to leave this up to a professional carpet installer. Here is where we will start. Notice how the transition is installed underneath the door when the door is closed. When done in this manner you will not see the carpet from inside the room when the door is closed or see the laminate outside the room either with the door closed. 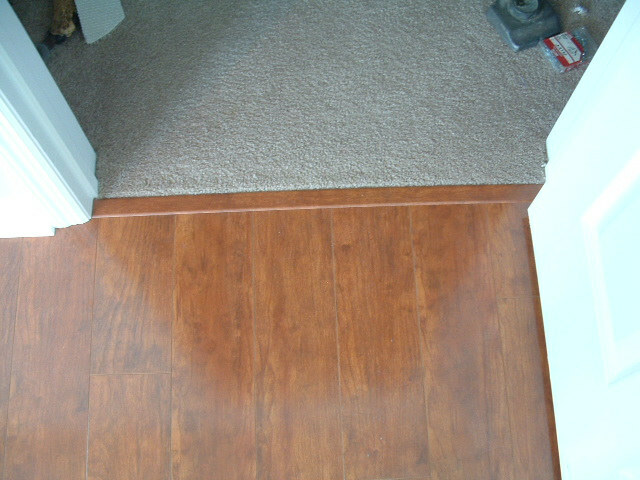 Before I installed the laminate I made sure to leave enough carpet which you can see is folded back as well as the padding. 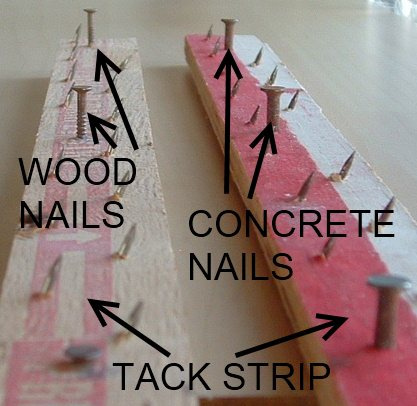 Tack strip comes pre nailed so the nails that nail into the floor will be either for a wood floor or concrete floor. You can see in this photo how the sharp nails are angled. The sharp nails need to be angled toward the transition. 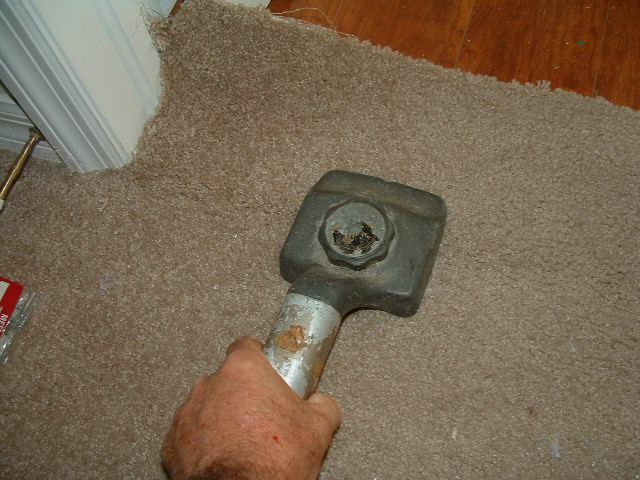 When carpet is installed the sharp nails are angled toward the walls. The first thing to do is to cut the tack strip to the width of the door way. Leave 1/4 inch space at each end so the tack strip does not touch the door frame.Leave a 1/4 inch gap between the tack strip and the transition also, and nail it into the floor. It is relatively easy to nail tack strip into wood floors. Concrete floors can be difficult, some concrete floors get really hard the older they get. If you find it difficult trying to nail into the concrete, drilling holes with a masonry drill bit and either using wood dowels and screws or plastic inserts will work just as well. In a typical doorway you should only need about 4 or 5 screws. After nailing the tack strip down you need to trim the pad about 1/2 inch away from the tack strip. 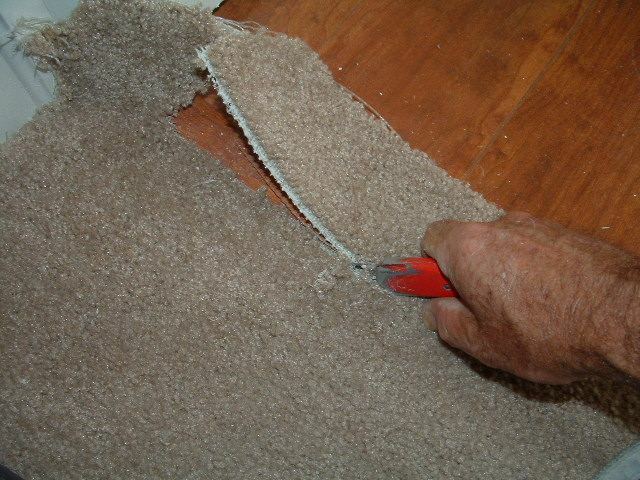 If it is cut too close to the tack strip, when the carpet is stretched up on the tack strip the pad can potentially ride up on the tack strip and prevent the carpet from hooking on to the nails. This is where you will need a carpet kicker to stretch the carpet onto the tack strip. Its not easy to describe how to use a carpet kicker, but I'll try. Basically you want to plant the kicker (the end with the sharp teeth) on the carpet about 1 to 2 inches in front of the tack strip, and while pushing the kicker teeth into the carpet at the same time hit the kicker with your knee. This is the way the carpet is stretched onto the tack strip. As you do this push the carpet onto the tack strip so it hooks onto the nails. There are other carpet stretchers that can be used such as a power stretcher. If you have access to one of these it will save your knees. 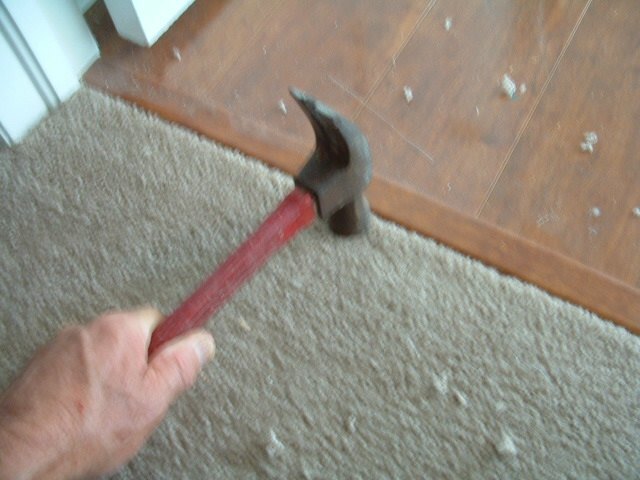 Here I use a hammer to rub the carpet on the tack strip, this insures the carpet will be hooked on the tack strip nails. 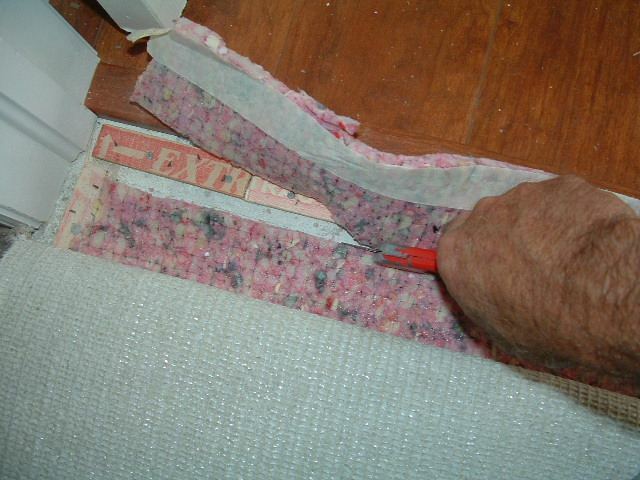 Cutting the carpet to fit into the gap between the tack strip and the transition can be tricky. You don't want it too big and you don't want to cut the carpet short. It needs to be cut just a little past the transition so the excess can be tucked down into the gap. I will explain how I cut the carpet with the carpet knife, here goes. I need to mention here again that carpet knives can be dangerous as they are extremely sharp. First I make sure I have a new blade in the knife. Next I make a small cut perpendicular to the transition just up to the transition. This way I can see where the transition is so I will know where to cut along the transition. Next I put he blade parallel to the transition, with the blade pushed up against the transition and angled toward the transition I cut along slowly keeping the blade angled so there will be a little carpet overlapping the transition after the cut. 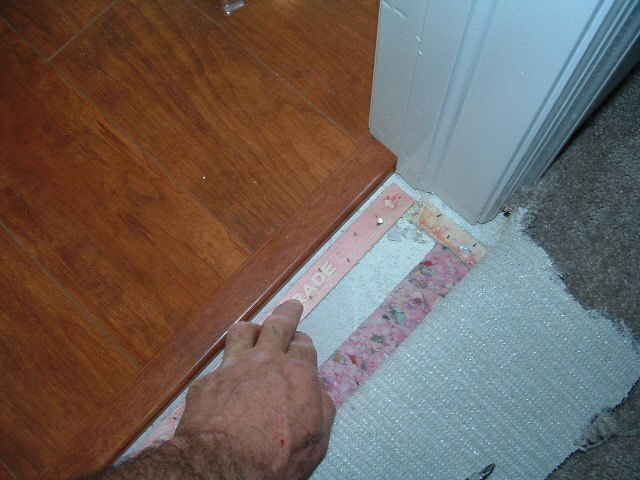 After the carpet is stretched onto the tack strip and cut to the correct size, it needs to be tucked down into the gap. I use a hook bill to do this. 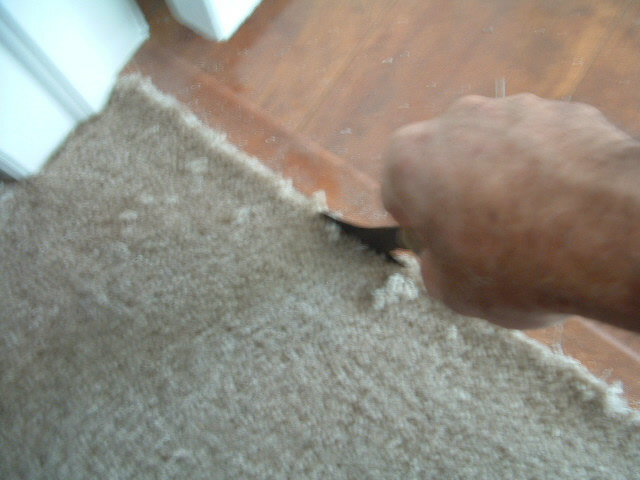 Just push the edge of the carpet down into the gap all the way across the door way and trim any strings off. 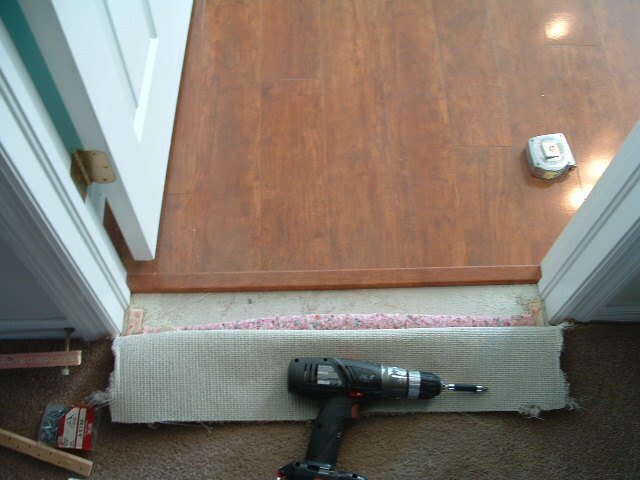 also tuck the carpet into the ends where the carpet meets the door jambs. 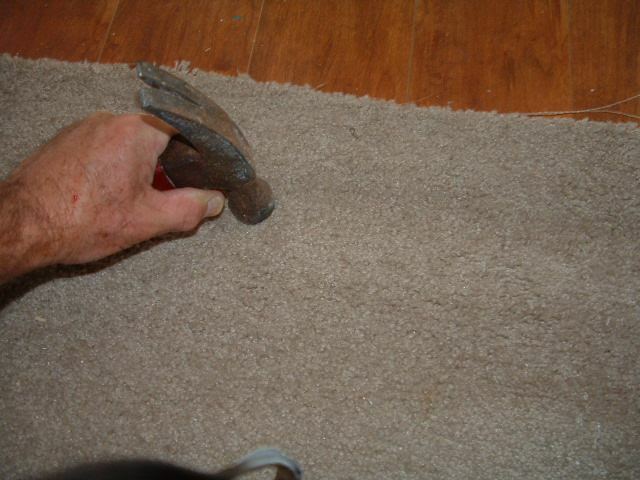 On some of the thinner carpets you may feel the sharp nails trough the carpet when you walk on it bare footed. In this case take a hammer and tap the nails down, this will also lock the carpet down as well. This is how you want the finished door way to look when it is completed.